Robbi and I are now starting to get excited about our upcoming Aroma Tours adventures which will begin in a little less than a month with our wonderful new Flavours of Spain Tour. We are greatly looking forward to sharing the places and experiences that we love with our Aroma Travellers this year and we are thrilled to see that after 18 years, 2012 is now confirmed as our most successful year ever. We look forward to sharing many lovely new photos of our 2012 adventures for you to enjoy in the coming months and in the meantime we invite you to visit our Photo Gallery Pages where you can browse through some of the thousands of photos we have taken during our past aromatic adventures. Our driver in Provence this year is our friend Patrick Sales who was born in the Cote d'Azur in the beautiful perched village of Tourettes sur Loup and attended secondary school in nearby Grasse, renowned as "The World Capital of Perfume". 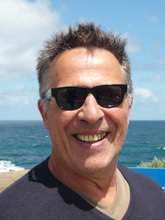 Patrick first came to Australia in 1970 and returned to live in northern France during the 90's, mainly in Brittany. He returned to Australia in 2000 and currently resides in Melbourne. He is passionate about literature, art, classic cars and adores French history. Patrick is charming and full of life and will bring a wonderful flavour to our time in Provence this year. Bookings for several of our tours are now closed and it also time for us to be gathering our last remaining Aroma Travellers for this year's adventures. Robbi and I are greatly looking forward to the start of our journeys this year and hope that we will have the pleasure of your company. Our Last Ever Provence Aromatherapy Retreat? 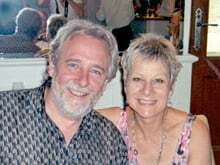 After 18 years of offering our Provence Aromatherapy Retreat to attendees from over 30 different countries, Robbi and I have decided that 2012 will be our last Provence aromatherapy retreat for the foreseeable future. This final retreat will be another fabulous week focusing on skin care and wellbeing with our renowned international trainers, Mindy Green formerly of Aveda ( USA ), Megan Larsen of Sodashi Skin Care ( Australia ) and of course Robbi with her wonderful Blossoming Heart work. With just 4 places left we invite you to join us for a wonderful informative week and the end of an era in our tiny village amongst the lavender fields of the Haute Provence. Simply put it is the fruiting body of a fungus similar to the mushroom or toad stool except that in the case of the truffle it does its fruiting underground. There are in fact more than a hundred different varieties of truffles growing in the wild but the vast majority only offer appeal to the creatures of the forest who enjoy eating them with gusto. 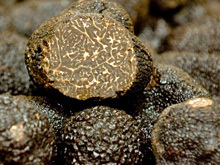 For us sapien types however, there are only a few specific truffle varieties that appeal to our sense of taste ( and not all of us at that ). We enjoy them very much I can tell you during our Provence tours. One of the best ways to enjoy truffles is to make an omelet with lovely fresh farm eggs and add slivers of fresh truffle - absolutely delicious! On the eve of our first Spanish Tour it seems so perfect that our dear friend Ailsa Piper, writer, director, teacher and actor, has turned her considerable talents to documenting her solo 1200 kilometer walk from Granada to Galicia, one of the lesser walked pilgrim trails across Spain. Having walked the 780 kilometer Camino Francés the year before, finishing at the cathedral in the medieval city of Santiago de Compostela and having researched much historical material about pilgrim traditions through the ages, one bizarre notion struck Ailsa in particular: the belief, in medieval times, that a person could be paid to carry the sins of another to Santiago, and by doing so could absolve the 'sinner ' from punishment. As she walked a fascinating idea was born springing from this research into medieval pilgrimage. Sinning Across Spain is the result of a collaboration with The Australia Business Arts Foundation and individual supporters of the project that Ailsa embarked upon. The book is beautifully written and raises some interesting questions. What sin would you have someone walk off for you? 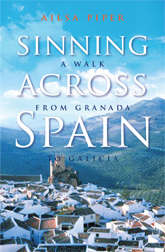 Ailsa travels through glorious villages and inspiring landscapes with her unusual cargo - a load of sins - all the while immersing the reader in the wonder and beauty that is Spain. I love the following anecdote from the book. As Ailsa walked along a road, a shepherd with his flock raised his staff to beckon her over and asked how her walk had been. Duro she replied. Pero hermoso. Hard. But beautiful. Ah the old man replied, just like life. Hard but beautiful. Sinning Across Spain is available in book shops throughout Australia and for our friends around the globe the publisher is Melbourne University Publishing.